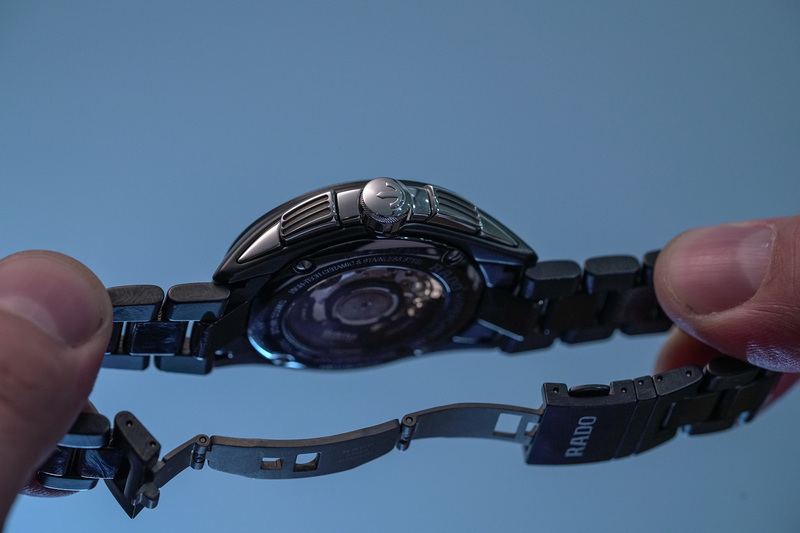 At Baselworld this year we saw Rado doubling down with two new limited-edition versions of their everyday and sporty HyperChrome chronograph. The first version, the HyperChrome Bronze, takes its form inside a case crafted from a combination of high-tech ceramic and bronze. 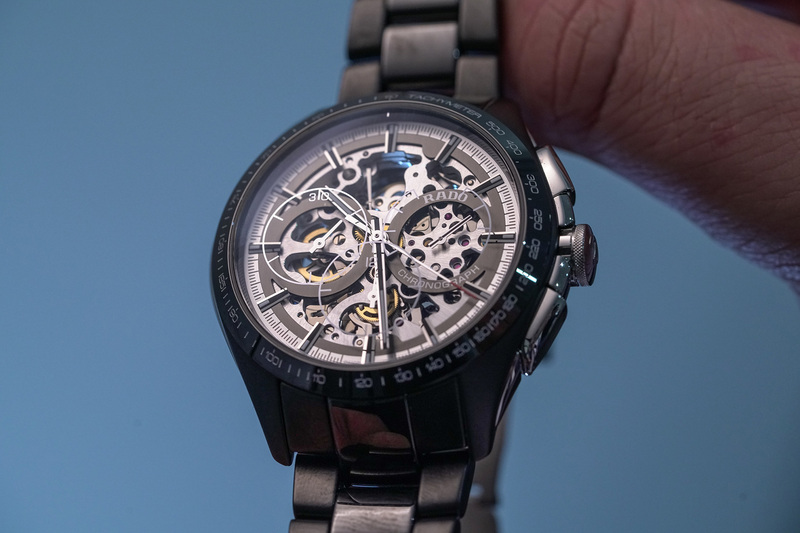 While the second opens up its ceramic case, foregoing a traditional dial and skeletonizing the movement. 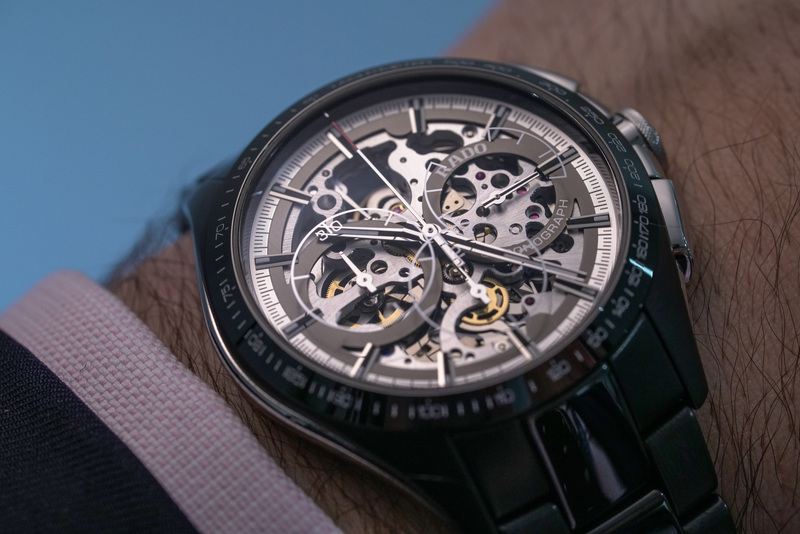 Earlier this week I went hands-on with the patina-friendly bronze version, and today it’s time to take a peek at (and through) the stripped back dial of the aptly named HyperChrome Skeleton. Consisting of an inner monobloc ceramic case with stainless-steel side inserts, and chronograph pushers and crown, the 45mm case is water resistant to 100 metres. Steel sides are polished, while the ceramic components are fired with a black pigment inside a high-tech oven at 1450°C, creating the super hard and lightweight case that is then extensively sandblasted to a matt finish – except for the ceramic bezel, which is polished and engraved with a tachymeter scale. Sapphire crystal on the front and back gives a view through to the openworked ETA 2894-2 chronograph movement inside. With its plate and bridges cut away into a latticework, and exposing its inner workings. Surrounding the outer edge of the dial is a minute track and applied hour indexes. While subdials for the, running seconds, and chronograph minutes and hours are printed onto the inside of the crystal. Ceramic is extended to the three-link bracelet, where polished centre links are sandwiched between matt black outer links. Strictly speaking of its case, this limited-edition version is visually similar to other versions of the HyperChrome chronograph. Wearing smaller than its dimensions would suggest thanks to its smoothly curved mid-case and a lightweight construction. However, the HyperChrome Skeleton isn’t just about its case. 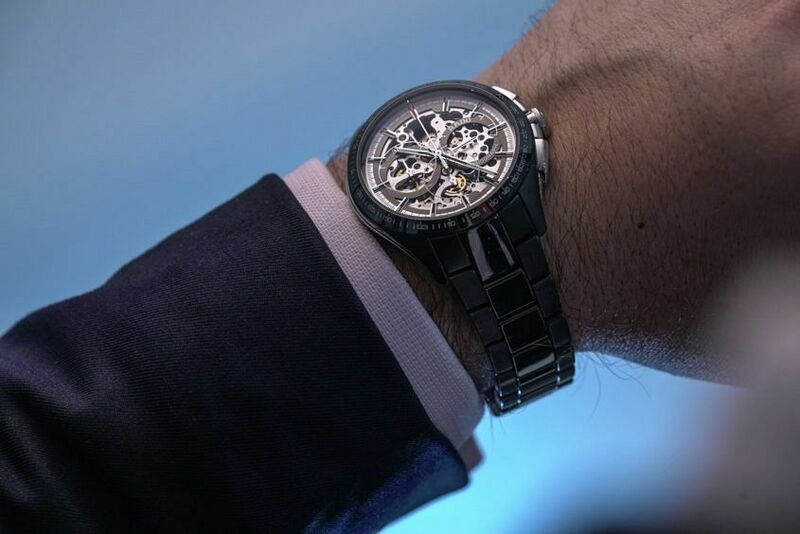 It’s about standing out, with the skeletonized dial drawing in gazes as it adds layer upon layer, upon layer. You’re not one to sit quietly in the corner. You like a little attention your way, and keep nothing hidden (not even your watch insides). 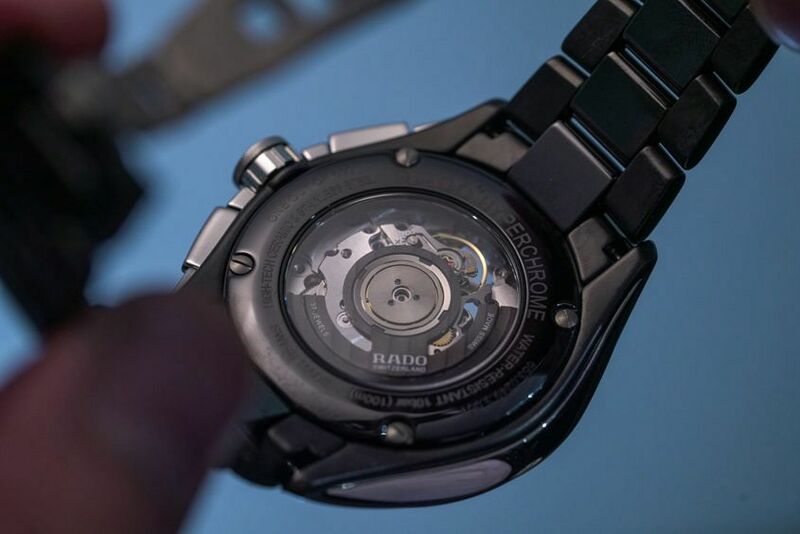 Kidding aside, you only need to like a high-tech case with the look of a high-tech inside to appreciate this Rado. The printed subdials on the inside of the crystal was a surprise – and not just because they can be tough to spot at times. But because they add a nice little extra dimension to an already deeply layered dial.